FREE TIME "4 ME" TIME? in particular kitchens, pantries, bathrooms, linen, and wardrobes. I will implement systems to keep these areas manageable in the future & provide any training required to do so. De-clutter, organise & systemise rooms creating a peaceful, stress free environment, including (but not limited to) living rooms, playrooms, children's bedrooms, kitchens and studies. Re-organise older siblings clothes into younger siblings storage bags or wardrobes, collate clothes no longer suitable into charity collections or disposal bags, systemise toy areas, implement toy storage solutions, and declutter toys no longer suitable to your growing child. Creating an ever lasting memory you can look at and cherish - rather than storing them on your computer or mobile device rarely to be seen again. 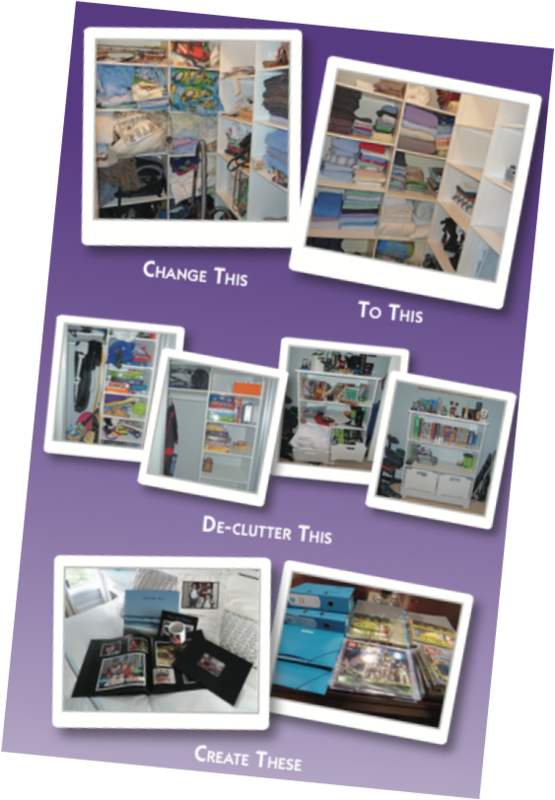 Complete albums of printed photos taking up valuable cupboard & drawer space. for your children's art, hobbies and schooling years - these can include (but are not limited to) - photographic books made from all of your children's special art projects (from toddler to primary), school year archive filing boxes, and manuals for instructions such as Lego. Meet with you to discuss the implementation of systems to create systemisation throughout the home, in particular all areas relating to children. COULD YOU OR SOMEONE YOU KNOW USE SOME "ME TIME"?